It’s been said of Jack Nicklaus (an avid fly angler) that he never hit a shot in practice without the same attention as a stroke played during competition. And while that level of focus may be hard to attain, it nevertheless underscores is the importance of being precise when it comes to practice sessions. We recently visited the only known fly fishing “golf course” in North America and after playing a round can attest to it’s ability to combine fun, education, and quality practice sessions. The course has been opened by the Orvis Company alongside their new store in Bend Oregon’s Old Mill District, with several holes actually on the Deschutes River. Orvis will hold their 2010 National Casting Competition here from August 12-15, with divisions for men, women and kids and plenty of nice prizes (read more about it in the extended entry). As for the course itself, which is open to the public, Designer Hutch Hutchinson’s vision for the layout mimicks that of your local “muni”in almost every aspect: 18 holes of fly fishing, each with a different layout, tees for beginner, intermediate and experts, and of course, very specific targets. Each hole incorporates a different set of casting skills and requirements in order to complete them at even par. Yes, there is a par for every hole, but getting it close doesn’t count, you’ve got to get the fly in the hole, literally. You’ll get a scorecard that contains a picture and a tee marker provides a guide for how to play the hole, including suggestions on the ideal rod weights and a brief description of how the required cast would be used in a real application. You’ll find everything from basic roll casting, curve casting, spey, reach and distance casts, to casting over, above, through and around all sorts of obstacles. To us the benefits were obvious, entertaining practice with specific focus on a variety of casting techniques and applications, all designed to make you a better angler. Best of all, there’s no green fee or tee time required for this golf course, it’s open to the public, you don’t even have to check in at the shop, but you can, and they’ll even loan you a rod or two to cast, play 3 holes at lunch, or after work as time allows. A word of caution, leave your John Daly grip it and rip it mentality (and clothing) at home, otherwise this track will eat your lunch, it takes a combination of finesse, distance, and accuracy to get around here. One thing is certain, alone or with a foursome, you’ll have a great time getting in some high-quality casting practice on this one-of-a-kind fly-fishing golf course. But, before you “tee” it up on the first hole, you might want to start getting your excuses in order, it’s not as easy as it looks. 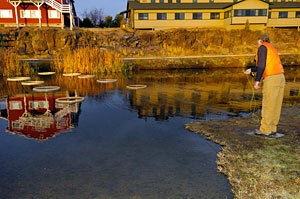 The 2010 Orvis National Casting Competition at the Old Mill in Bend, Oregon will be held on the first-of-its-kind 18-hole fly casting course located adjacent to the Orvis Bend retail store. The course was designed to test and improve fly casting skills in a variety of settings much like those you’d find in actual fishing conditions. The 2010 National Casting Competition will use selected holes on the course but each competition hole will be modified from its current format challenge for this competition. The 2010 National Casting Competition dates are August 12-15, 2010. A $25 entrance fee is required for all entrants in the individual competition events. A $400 entry fee is required for each team participating. Entrants are also required to fill out the required entry form for either the individual or the team competition. Entry forms can be sent via email to [email protected] or included with your check and sent to this address. 50 competitors are allowed per division and are entered on a first-come, first-served basis until all slots are filled. For the team competition, 15 teams will be entered on a first-come, first served basis until all team slots are filled. All entry forms and checks need to be received no later than July 31, 2010. If you’ve previously participated in a professional casting competition then you will be entered in this category. If you work in the fly fishing industry in any capacity but have never participated in a professional casting competition then you will be entered in this category. This year we’re introducing a team competition to the event. A team consists of any 4 participants (men or women). We’ll take up to 15 teams for the competition. 1st place prize – ½ the amount of money from the team entry fees will be the first place prize. For example, if all 15 team slots are filled, the final prize will be $3,000. The other ½ of the team entry fee will go directly to the Deschutes River TU chapter to benefit local conservation projects in the Bend area. New for this year is a kids event competition. All skill levels are welcome to participate. We’ll have two different age divisions with boys and girls competing together in each age group. Ages 6-12 and Ages 13-17 are the two different age groups. Orvis donates 5% of pre-tax profits annually toward conservation efforts throughout the U.S. As part of the Orvis conservations mission, part of the proceeds from the 2010 National Casting Competition and other donations from Orvis will go to the Deschutes River Chapter of Trout Unlimited to aid in local conservation projects. For more information on the casting course, visit www.orvis.com/bend for a full course description.